I have recently been working on my side project Grass again. The web application tracks a ton of information and requires displaying multiple data tables that look good on any size device. I had successfully used the datatables-editable plugin in the past and wanted to try something new. While searching for options, I came across the FooTable plugin for jQuery. I instantly fell in love with the design, but I was also quickly disappointed to find out that Footables were not yet editable. Unfortunately, this meant that all beautiful FooTables display read only data, and I needed a solution that would allow users edit and add to the data displayed in my application’s FooTables. So, I decided to take a stab at creating a FooTable.Editable plugin! 1. You don’t necessarily need jQuery UI to build a simple accordion. You could even take this concept a bit further by changing classes on the span during the click event to change the direction of the arrow using background-position or a separate background image file. I read that the last way performs up to 10x’s faster, but I have not performed any bench marking on this. 3. If you want bind to events on dynamically created objects, use the on() function. In the example above we are binding to dynamically created input tags of type=button that have the class footableButton assigned to them. In addition, we are assigning different click event behaviors based on the button’s text. If the button is an “Add” button, we trigger an “Add” command. If the button is a “Delete” button, we trigger a “Delete” command. 4. HTML5 data attributes are cool! 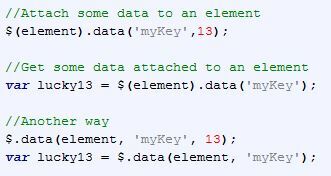 Another way to attach data to html tags is by using a data- attribute. The attribute must begin with “data-” and can be placed in your html tags to save information about that particular tag. 5. Creating and binding to custom events in jQuery is easy. I recently ran into a situation where I needed to ensure that a function was executed directly after a particular click event had completed. I tried attaching the function directly to the click event with poor results. I soon realized that placing the function inside a custom event allowed me to raise that custom event inside my targeted click event. This ensured that the function would always run only after all functions bound to the targeted click event had completed.